Jeremy Knight (Edward Austen's third great grandson), shares his memories of over forty years living at Chawton House on the ancestral estate where Jane Austen herself lived and wrote, with the month of April. 'On Easter Sunday, the resident family would get together and my mother would provide the most wonderful roast lunch for all twelve of us to eat the Great Hall. As well as my wife and our two children, the twelve included my parents, Edward and Elizabeth Knight, my younger brother Robert and my elder sister Penny with her husband and three children who lived on the top floor. Some years we were joined by my sister Anne and her family who lived in Buckinghamshire, or my older brother Richard and his family, who lived in Gloucestershire. 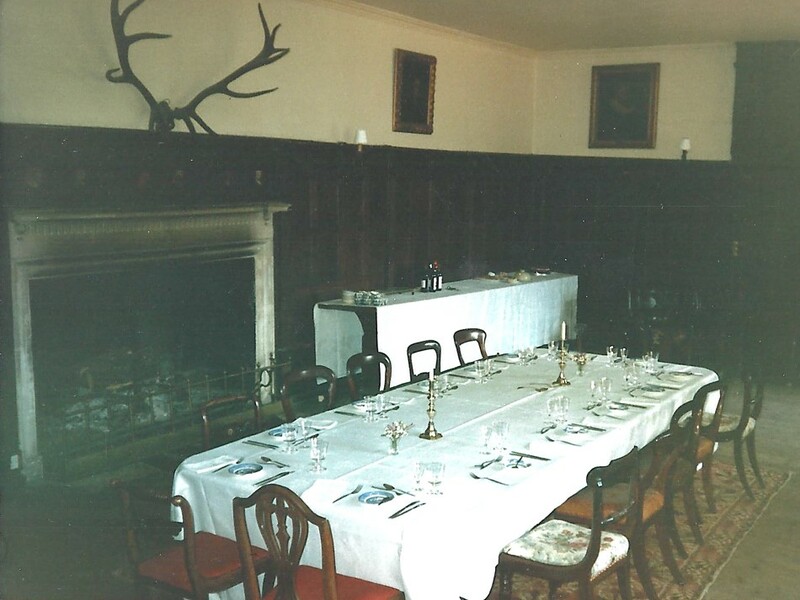 For family lunches and special occasions we ate in the Great Hall and sat at Edward Austen’s grand dining table. This table is now in the Dining Room at Chawton House and is the same one that was in use when Jane Austen visited the ‘Great House’, as she called it. As a young woman my mother had been to finishing school and completed a cordon bleu cookery course in Paris, so was a very accomplished cook. None of us have ever been able to match her roast potatoes! After lunch we would take a walk. On rare occasions we still saw snow in April but there were many years with brilliant warm, dry weather and we spent a lot of time outside enjoying the grounds of Chawton House. At last we could leave off scarves and hats and change our thick winter coats for lighter jackets. Early in the month there were still swathes of daffodils sweeping in front of the ha-ha. Later there would be wonderful bluebells in the woods. Trees and shrubs would lose their stark greyness and take on a green tinge as leaves sprouted. Wild birds would be nesting and could be seen flying about with desirable items in their beaks to make their nests – including feathers, twigs, moss and sheep’s wool. We walked across the front paddocks and fields, up through the woodlands and, at the very top, into the walled garden built by Jane Austen’s brother Edward. Jane mentions Edward’s plans to build the walled garden in a letter but did not live to see it created. The walls provide protection from the worst of the weather - there is no wind, less frost and somehow it captures the warmth of the sun. Glasshouses ran along the south wall, painted white inside, and in earlier times a nearby boiler had heated the pipes that ran through. The heat from the pipes and the sun’s reflection on the white walls heated the glasshouses to the temperatures needed to grow exotic fruits not easily available in earlier times. There once would have been several gardeners maintaining the lawns, wilderness and herbaceous borders as well as the walled garden. I remember as a child there were still vines, peaches, tomatoes and other fruit and vegetables brought on early in the glasshouses. My wife and I used the walled garden to grow fruit and vegetables for the family and to warm the earth and provide shelter for small plants we used old glass and metal cloches - like a mini greenhouse over them. In April we planted early crops like onions and new potatoes in the ground and seeds in trays in a greenhouse I had built against an outbuilding close to the house. We did not have access to a water tap in the walled garden so had to cart water in buckets all the way up the lawns. The ground was sheltered so did not dry out too much, but as the vegetables grew in the later months this became an onerous task. We were lucky to have the grounds, but nothing was easy! You can read more about the Austen Knight family of Chawton in Jane & Me: My Austen Heritage, written by Jeremy's daughter, Caroline Jane Knight.